Post reading this article one will appreciate that how an efficient audit can be a value addition tool to the business houses. Depth of procedures of auditors will lead to safeguard the registered person from facing the same issues in assessment. So, negotiation of audit fee at the cut throat level does not save the interest of business houses and auditors’ fraternity. Merely the examination of the data of GSTR 1, 3B and other forms will not be sufficient for GST auditor. 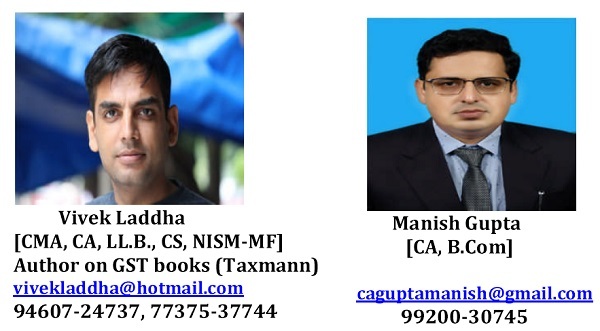 For detailed reading one may refer the book titled as ‘GST Audit Manual’ published by Taxmann. As per GST law, registered person whose aggregate turnover during a financial year exceeds INR 2 cr shall get his accounts audited by CMA/CA. Many of the business houses are in impression that GST auditor has to prepare the reconciliations only. 1) GSTR-9C is the responsibility of auditor wherein the auditor has to state in para 2 of Part II of GSTR 9C whether the said registered person has maintained/ has not maintained the books of accounts, records and documents as required by the IGST/CGST/SGST/ UTGST Act, 2017 and the rules/notifications made/issued there under. It signifies that auditor has to report on the compliance of section 35 of CGST Act and rule 56, 57 and 58 of CGST Rules. So mere preparing the reconciliation is not to be prepared. Auditor may have to visit the client place to examine the books of accounts, records etc. as every document may not be made available online to the auditor. Merely the examination of the data of GSTR 1, 3B and other forms will not be sufficient for GST auditor. The rate wise liability separately for forward charge and reverse charge is to be reported in Pt. 3 of GSTR 9C). That means in this table, the auditor has to examine the applicable HSN for determination of tax rate. GST auditor may to examine the aggrements held between registered person and its counterparties for the same. Story does not stop here, infact the auditor has to determine the valuation as per section 15 and valuation rules. Moreover he will have to examine the place of supply. The penalty amount as sought by Chapter XIX of CGST Act is also to be reported in Pt. 3 of GSTR 9C which means auditor has to examine every transaction/ activity from the eyes of GST law. E.g. If the invoice is issued in contravention to the rule 46 (say any of the content of the invoice as required by rule 46 is not written on the invoice) will also lead to invite the penal consequences of maximum INR 50000 as per section 125 of CGST Act. One may think that to what extent the auditor has to examine for performing the audit (after all, he has to report in terms of ‘true and correct’ and not the ‘true and fair’.). The expenses wise ITC to be reported by auditor in Table 14 of Pt IV of GSTR 9C which means the auditor has to apply the procedure to check how much amount of ITC is eligible for every activity. Kindly take care this exercise is to be done by auditor and he should not just to report what the registered person has done and dealt with. Registered person and auditor both are required to be very clear about these procedures. Depth of procedures of auditors will lead to safeguard the registered person from facing the same issues in assessment. Auditor to be aware that lack of negligence in applying the procedures may invite the adverse proceeding against them in GST law and code of ethics of their regulators. Negotiation of audit fee at the cut throat level does not save the interest of business houses and auditor’s fraternity.